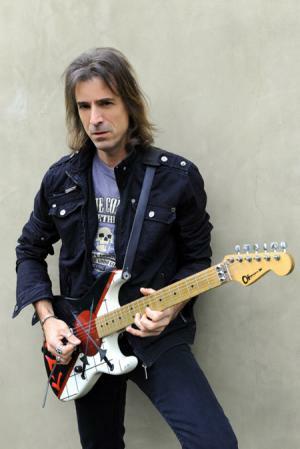 Warren Justin DeMartini was born on the 10th April 1963, in Chicago, Illinois USA, and is best known as the lead guitarist for the glam metal band Ratt, with whom he achieved worldwide fame and success during the 1980s. His career began in the early ‘80s. Have you ever wondered how rich Warren is, as of early 2017? According to authoritative sources, it has been estimated that DeMartini’s net worth is as high as $4 million, an amount earned through his successful career as a musician. Warren DeMartini was the youngest of five sons, and spent his childhood in River Forest in Illinois, before the family moved to San Diego, California, where he matriculated from La Jolla High School in 1981. He started college later that year, but decided to leave to pursue a music career. He had shown an interest in music, and guitar specifically, from when he was merely seven or eight years old. His first guitar was given to him by his mother, but due to the frustration with its poor quality and bad sound, he emulated his idol Pete Townshend of The Who, and smashed it into pieces. Consequently, he was forced to earn his next guitar, which is why he took a break from playing until he could afford one. His second guitar was an electric Cimar Les Paul copy, on which he learned to play. Warren’s talent was noticed in the area of San Diego, especially when he won “Best New Guitar Player in San Diego” at Guitar Trader the first year he competed. As a consequence, he was invited to join a Los Angeles band Mickey Ratt, later renamed Ratt, with whom he would reach stardom. Ratt are recognized as one of glam metal pioneers who helped to establish the genre, along with such bands as Mötley Crüe, Quiet Riot and Bon Jovi. Warren joined the band to fill the vacancy left by Jake E. Lee, who went to play with Ozzy Osbourne. However, it would turn out that Warren was what was missing in the band, which had limited success until he joined. The sound of his guitar made the band recognizable, while his creativity also helped produce some of Ratt’s signature songs, such as “Round and Round” (1984). DeMartini remained with Ratt until their break-up in 1992, and by that time they had released five studio albums. Their debut studio album, “Out of the Cellar” was released in 1984, and was certified as triple platinum, and spawned hits such as the aforementioned “Round and Round”, as well as “Wanted Man” (1984). Their other pre-break up studio albums were also certified platinum, though none would outdo the success of their first one. The band reunited twice over the years, and DeMartini was always a part of the line-up. During the first reunion, they released two more albums, but to poor critical and commercial receptions. Their last album, “Infestation” was released in 2010, three years after their second reunion. Interspersed with his career in Ratt, Warren briefly joined another popular glam metal band of the era, Dokken, and toured with Whitesnake in 1994. DeMartini also released one EP in 1995, and a studio album “Crazy Enough To Sing To You in 1996” in 1996. He was supposed to join the line-up of heavy metal band Dio in 2003, replacing Doug Aldrich, but left due to creative differences with the band’s founder Ronnie James Dio. During his career, DeMaritini has expressed admiration for numerous musicians, and counts Jimi Hendrix, Pete Townshend, Joe Perry, Frank Zappa, Miles Davis, Eddie Van Halen, and Randy Rhoads among his influences. In his personal life, DeMartini is married to Kathy Naples, with whom he has a son, Wyatt. He is nicknamed Torch. 1 Has a son Wyatt with his wife Kathy. 2 His best friend during school was Ralph "Rolle" Love, who later was part of the Beat Farmers, a rock group whose song "Tidal Wave" was included in the movie "Major League". 3 Graduated La Jolla High School (La Jolla, California), in 1981. Brütal Legend 2009 Video Game writer: "Lay It Down"
100 Greatest Hard Rock Songs 2008 TV Movie writer: "Round and Round"
The Wrestler 2008 writer: "Round and Round"
Grand Theft Auto: Vice City Stories 2006 Video Game writer: "Round and Round"
The Golden Child 1986 "BODY TALK"